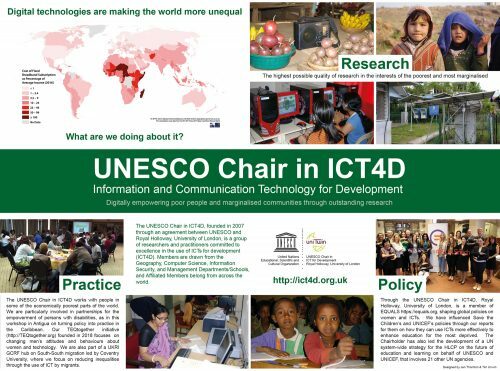 The UNESCO Chair in ICT4D would like to take this opportunity to wish all of our members and colleagues a very successful year ahead in 2017. Given the events of 2016, the next year seems likely to be highly volatile on the geopolitical front, but hopefully we can all move together effectively to enable more of the world’s poorest and most marginalised to benefit appropriately from ICTs. To this end, at the start of 2017, we are launching an exciting new series of informal discussions for postgraduates involved in the UNESCO Chair’s activities, entitled Technology and empowerment: multidisciplinary conversations, the first of which will be on 13th January from 1-2 in McCrea 229 at Royal Holloway, University of London. These are intended for postgraduates working on multidisciplinary aspects of ICT4D, and are open to anyone who is interested. Silvia will also be presenting a seminar at Royal Holloway, University of London, on 2nd February 2017, at 13.00-14.00 in the Queen’s Building (QB136). This is entitled The Affordances of Big Data for Poverty Reduction: Evidence from India – do please share details with anyone who might be interested in attending. Posted on January 4, 2017 January 13, 2017 by Tim UnwinPosted in Postgraduates, SeminarsTagged ICT4D, Postgraduates, Seminars.